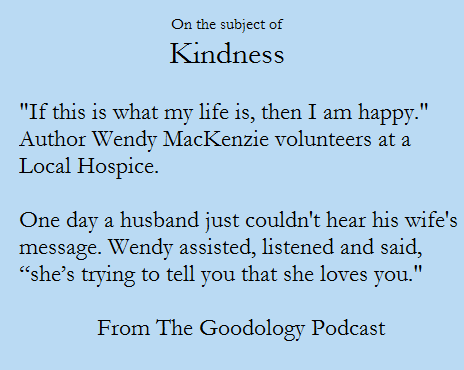 Author Wendy MacKenzie volunteers at a local hospice. One day a husband was trying to hear his wife’s message. The husband just couldn’t hear his wife. 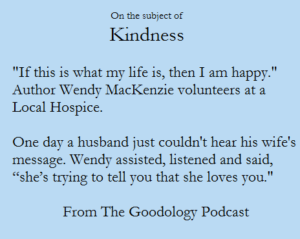 Wendy assisted, listened and said, “she’s trying to tell you that she loves you.” Wendy said that if her life came was about acts like this, then her life would be complete. Her work with hospice allowed her to say that if, in the end, this is what her life was about she would be happy. These are the moments. How many of these kindness and special moments are you living daily? Wendy lives in Australia. She has always had a love of writing and all things Celtic and mystical. She has been an advertising copy writer and a production runner for Mission Impossible when it was being filmed on the Gold Coast in Queensland Australia. She knows that there is more to life than our eyes can see and our ears can hear and that there is great magick in you dear reader. Wendy’s Website – Writing ignites the natural passion that innocently lingers within every man and woman. The Legend of Terragorn takes us on a journey certain to enchant and enthrall with its alluring characters and down-to-earth Aussie frankness and ingenuity. Escape with us now as we invite you to be part of this amazing “life changing” adventure! Then To make the world a better place she would love to see more respect. And kindness. We all should really recognize how special we are. It’s magick. We are magick. Thank you Wendy MacKenzie.